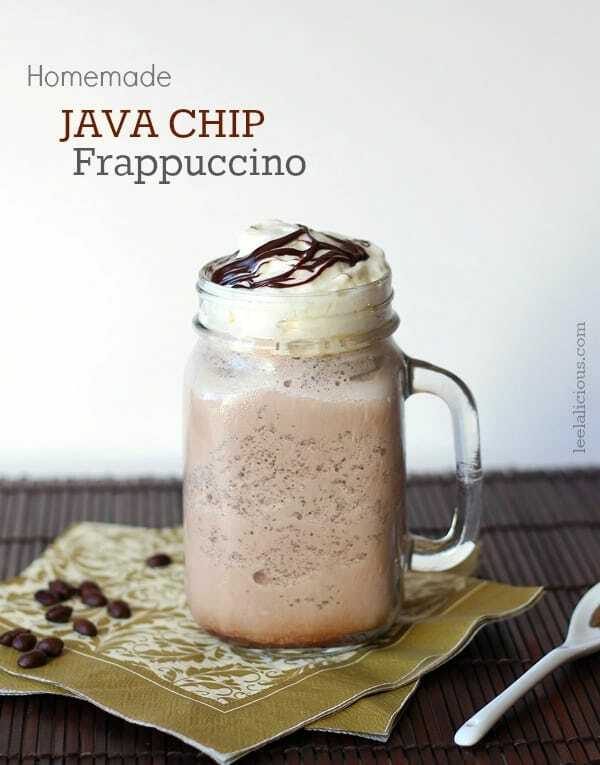 My Copycat Starbuck’s Java Chip Frappuccino recipe is a healthier version of the popular iced coffee indulgence. 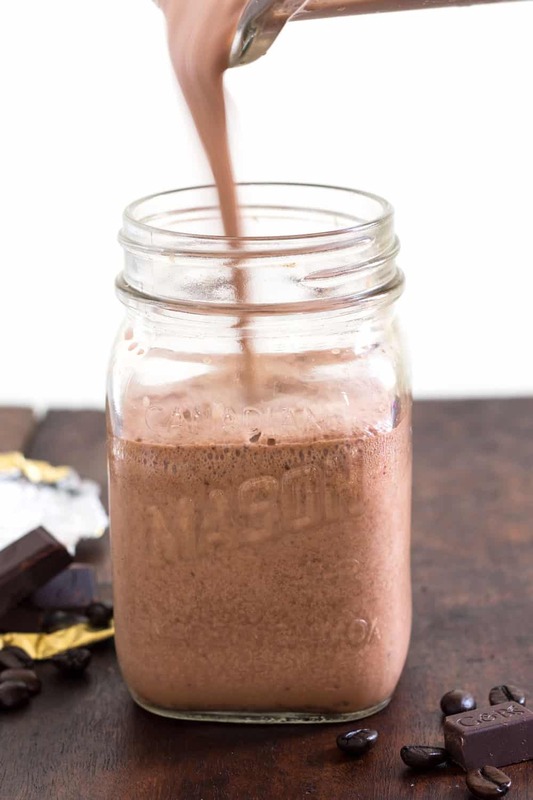 This homemade coffee chocolate shake is dairy-free (coconut milk & cream) and naturally sweetened with only a little maple syrup. Today’s recipe isn’t entirely new. 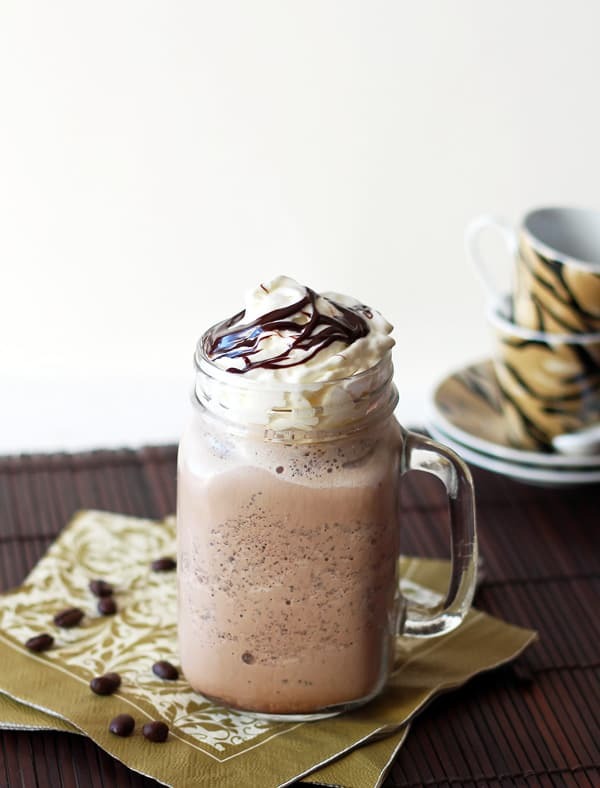 Actually, I completely revamped this copycat Java Chip Frappe from 2 years ago. This is one of those posts that got little attention on social media, but is doing quite well in search engine results. But when I look back at the recipe I realize that I have come a long ways in my healthy eating journey. 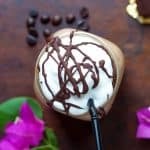 The recipe I posted just over 2 years ago, included whipped topping and commercial chocolate sauce – ingredients I wouldn’t use these days anymore. So I decided, it was time to update the recipe. 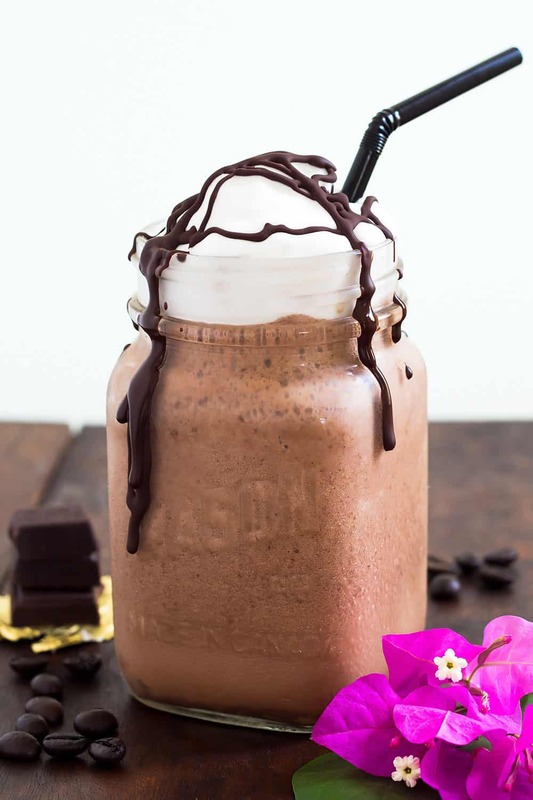 I came up with this new homemade Java Chip Frappuccino, that is not only cheaper to make than getting it’s Starbucks counterpart, but also much healthier. I used coconut milk and cream to make it dairy free, maple syrup and quality dark chocolate to cut down on the refined sugar. While we are on the topic of video, can you do me a huge favor?? I had to start over my Youtube channel recently and I would love, if you could subscribe to it. You can find the channel HERE. Thank you so much! 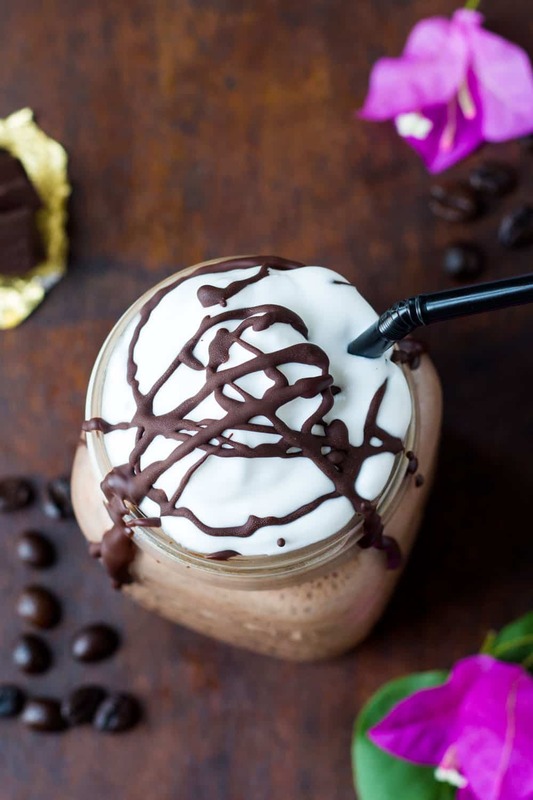 This Copycat Starbucks Java Chip Frappuccino is a healthier homemade version with coconut milk (dairy-free) and only a little maple syrup as natural sweetener. Add espresso, 1/3 cup coconut milk, 1 tablespoon maple syrup, cocoa powder and 1.5 cups ice cubes to a high speed blender and blend until smooth. Taste the coffee shake and adjust to your preference. If it is too thick, add the remaining coconut milk. For more sweetness add more maple syrup. And more ice for a thicker shake. Blend again until smooth. Then add the dark chocolate chunk and pulse only, to break them up into small bits (small enough to fit through your straw, if using). Fill the homemade Java Chip Frappuccino into a serving glass (I used a mason jar) and top with whipped coconut cream and drizzle with melted dark chocolate. Looking for the best blender for you? Check out this article to learn what to look for in the best smoothie blender – I also included a detailed review of my personal favorite blenders. Just because it includes a little throwback to the time that I had crazy pregnancy cravings and to give you a point of reference, I am leaving the old post and recipe here at the bottom. 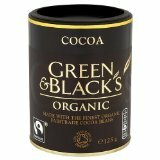 It is hard to believe that a coffee lover like me got totally turned away from the taste and smell of the brewed bean – but it’s true. For the first trimester of this pregnancy I couldn’t handle coffee AT ALL. Being in a coffee shop or in the kitchen first thing in the morning, while someone else was brewing coffee, send me on a run for the nearest washroom. And as everyone knows, you just CAN’T ignore or suppress pregnancy cravings. However, at 5 bucks a fix this baby is getting expensive before it’s even here. So I set out to create one of my favorite iced coffee drinks at home. The Java Chip Frappuccino combines iced coffee/espresso with chocolate and chocolate chip bits for a great crunchy texture. Not only is this homemade version easier on the budget, it also is ‘adjustable’. Unfortunately, most iced coffee drinks available to purchase are waaayyy too sweet for me. So I adjusted the sweetness of this homemade version to my preference but I also included options for sweeter taste buds. Place the ingredients except chocolate chip and whipped cream in a blender or food processor and blend until smooth. Add chocolate chips and pulse a few times to desired size/crunch. Pour into a serving glass and optionally top with light whipped cream and a chocolate sauce drizzle. If you prefer a sweeter frappuccino use chocolate sauce instead of unsweetened cocoa powder and chocolate milk instead of regular milk. ** I am not trying to stir up controversy and realize that others disagree, but I decided that 1-2 servings of coffee are acceptable for my pregnancy. Frappuccinos are my favorite – can’t wait to make them at home! I’m not a coffee drinker, but my teenage daughter loves these drinks. Where do I buy expresso? Is it in the grocery store? Hi Michelle, as non-coffee drinker you probably don’t have an espresso machine. There is instant espresso powder (I really like this one). Otherwise some really strong coffee can be used in place. All over 🙂 any specific ingredient you can’t find? The chocolate drizzle on top is speaking to me in the sweetest of words. YUM!